#1 Grandson, Diva Dog, and I weren’t the only ones in the backyard soaking up the warm rays of the sun after the rain. 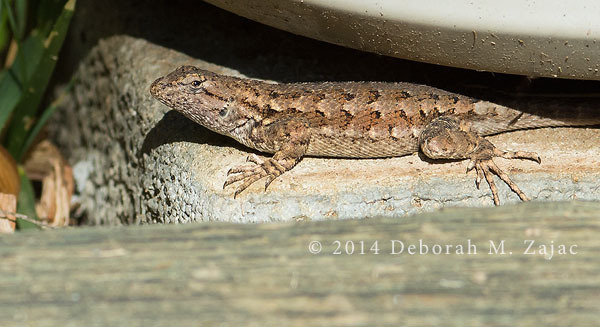 It was on the brick flower border sunbathing until I scared it with my camera. It sought the shelter of the AC unit. I crept as closely as I could to make this image of it, but I pushed my luck moving too close, and off he ran under the unit, and out of sight. A she! Do you think it’s pregnant? 🙂 Thank you for the ID and visit! I appreciate it very much. How cool is that?! I miss seeing lizards. He’s cute. Looks like he’s eating well.